'The Realm' sampled parts of Beat In Time's Time. As a reaction, Beat In Time released The Real Time, which is 'Time', spiked with the Realm accapella. This above release ["The Realm"] was kind of a copy of "Ease The Pressure" by Subliminal Aurra. My Sister Francesca Simonelli wrote all the verse lyrics for "Ease The Pressure." Friend named Mariana from Baltimore is who did the spoken word on "Ease The Pressure" , (reading the lyrics that my sister Fran wrote). 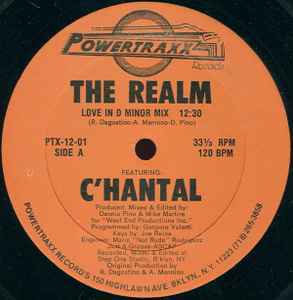 This Label that "The Realm was released on (Power traxx) , was owned by Friend Dennis Pino in Bklyn.. He and all who were part of making "The Realm" liked "Ease The Pressure" very much and wanted to kind of do their own take on it... The Male Vocals on "Ease The Pressure" are Ralphie Dee. Ralphie Dee is one of the Writers of "The Realm", so You can see the further connection. Anthony Manino is also a writer on "The Realm" .. All are long time friends. This came out at a time when KLF and Orb were very popular. "Ease The Pressure" was engineered by Tommy Musto. Dennis , who owned the label that "The Realm" was released on, also had a record store in Bklyn named Timeless (Going from memory). He had a little studio in the record store, and that studio was one of the first studio's I ever interned for :) I met Lenny Dee at this Store/Studio, in the mid 80's, and "Ease The Pressure" was tune that Lenny Dee and I produced together. "Rhythmatic movement, sensations of the mind"
I would say this sounds as Jade 4U voice . Fantastic voice, loads and loads of classic tunes from Belgium. I love acapella sounds like this. There where more of them used in dicotheques around Belgium and the Netherlands. Does anyone know any other like this? I remember a song called blackout... but other don't come to mind. please help me out! This is all nice, but does anybody know who does the voice belong to? Why is she not credited ? sampled "pleasures of the highest sense"
sampled "something for your mind, your body, and your soul,"
"a journey of force .."
sampled "for your mind your body and your soul"
You will have heard the vocal or elements of it sampled time & time again, but this is also a great tune, the vocal is only really used on the intro. Main mix for me is Love In D Minor, as it slowly builds and drop’s back down introducing different elements and then builds right back up toward the end of the tune. Lots of simple elements fused together really well, including the really haunting hook that comes in about 2/3rd of the way into the track, which apart from the vocal is what I remember most about the track. Great piece of early 90’s House / Techno. Some of the artists that have sampled the acapella are: Robotnico: 'Backtired' ('eternity's passed'), The Ultimate Seduction: 'The Ultimate Seduction' ('the ultimate seduction'), Speedy J: 'Something For Your Mind' ('something for your mind').